A viral video has captured a cruise ship speeding into a harbour during a whale watching trip. 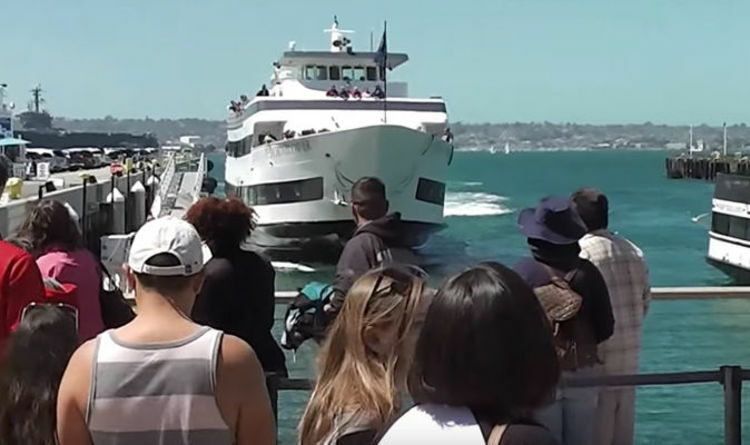 Filmed in San Diego, the busy ship called the “Adventure Hornblower” is seen trying to dock. It appears to be full of people who are on the roof and the decking of the boat. What happens next takes a number of people by surprise. As it continues to drive at speed, it shows no signs of slowing down as it nears the pathway. The people watching it quickly notice this and begin running out of the way. Suddenly all of them run, whilst an older lady can be seen struggling to rush. Thankfully a man goes over and helps her along, just as the front of the ship ploughs into the path and causes destruction and a huge hole. The video has had over nine million views with users shocked at what happened. Another was surprised at the actions of the captain of the ship. Another video caught a cruise ship being launched into the sea whilst a number of people watched. As it slid down the ramp into the water, a huge wave surged into the air. The people watching realised too late and were soaked by the plume of water. One young girl was the star of the show for online users.